Spicy Deviled Eggs are made with mayo, mustard, relish, sriracha, jalapeño, and bacon. This easy recipe is the perfect snack to serve at summertime barbecues and cookouts! 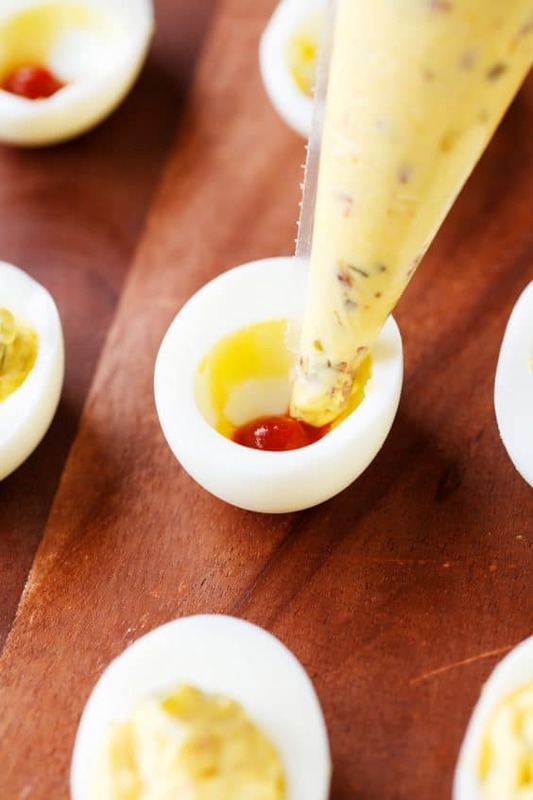 When it comes to crowd-pleasing appetizers and munchies, you can’t go wrong with deviled eggs. Now that cookout season upon us, keep this simple recipe for Spicy Deviled Eggs on hand to whip up for all your summer gatherings! 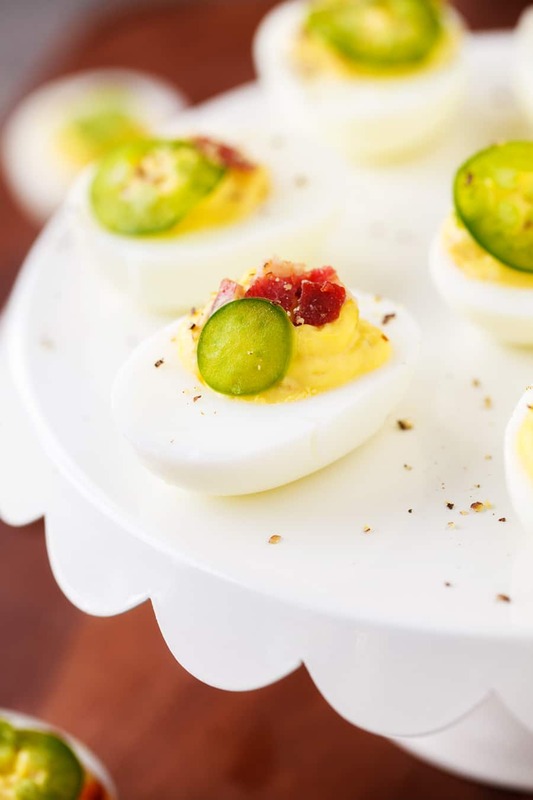 Deviled eggs make a wonderful snack any time of year, but I think they work best in casual settings like backyard barbecues! These tasty finger foods can be served chilled from the fridge, and best of all, you can customize them any way you want. This recipe is my favorite because it’s easy to make, and of course, it’s so good! Smoky, savory, and spicy, this satiating recipe is full of mouthwatering flavor. 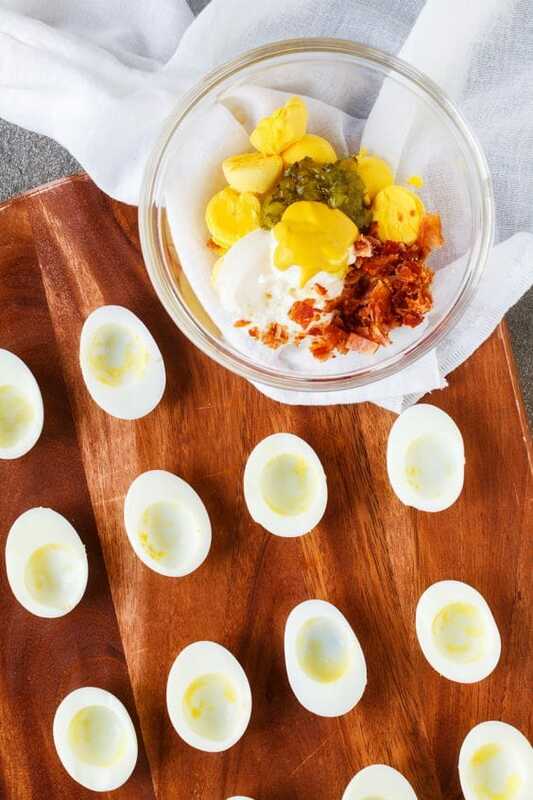 The creamy centers of the egg halves are made by mixing the hard-boiled yolks with mayonnaise, mustard, pepper, sweet relish. A touch of sriracha and jalapeño add a kick of spice, then one final ingredient ties it all together: BACON! Each two-bite portion is garnished with a jalapeño slice, a dot of sriracha, some fresh ground pepper, and a few crunchy bacon crumbles, of course! As I mentioned, this basic Spicy Deviled Eggs recipe can be tweaked depending on your preferences. You can try using fresh herbs like parsley, dill, or cilantro, or add a dash of paprika. And if you don’t like spice, just leave the sauce and peppers out. Another tip: the fresher the eggs you use for hard boiling, the harder they are to peel. Try using eggs that are at least a week old, and the shells should come right off. 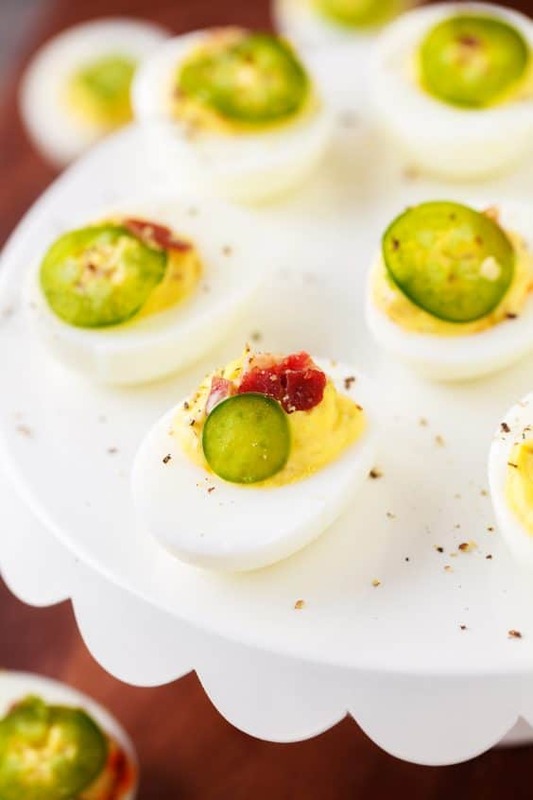 Spicy Deviled Eggs are perfect for novice cooks to make, whether you’re hosting a gathering or you want to bring a dish to someone else’s house. But even if you’re an experienced chef, this classic dish is an easy side dish to add to the picnic table. If you’ve never enjoyed these bite-sized snacks alongside traditional cookout foods, you’re missing out! They taste scrumptious alongside potato salad, coleslaw, burgers, hot dogs – you name it! And don’t forget, this appetizer even makes for delicious leftovers – I’ve even been known to toss a few on top of a salad to make a meal out of it. 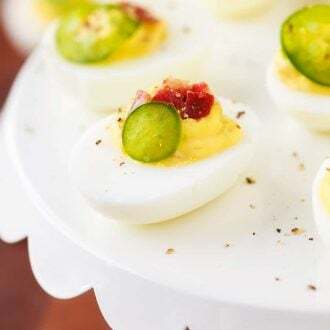 For a quick, easy recipe to serve friends and family all summer long, Spicy Deviled Eggs are a classic appetizer that staves off hunger and satisfies taste buds. While hard-boiled eggs can usually keep for up to 1 week, once prepared into deviled eggs, they should be consumed within 2 days for best results. No, they egg white portion will become tough and rubber after freezing, it’s best to serve them chilled and fresh. Pin this Appetizer Recipe for Later! Place eggs in a single layer in a saucepan; add water to a depth of 3 inches. Bring to a boil; cover, remove from heat and let stand 15 minutes. Slice eggs in half lengthwise, and carefully remove yolks and transfer them to a medium bowl. Trim a tiny slice off the underside of each egg half so that eggs will sit flat. Add 3/4 of the chopped bacon, mayo, mustard, and relish to the egg yolks and mash until smooth, add salt to taste. Transfer to a piping bag. Add a small dab of Sriracha to each egg white cavity before piping in the yolk filling. 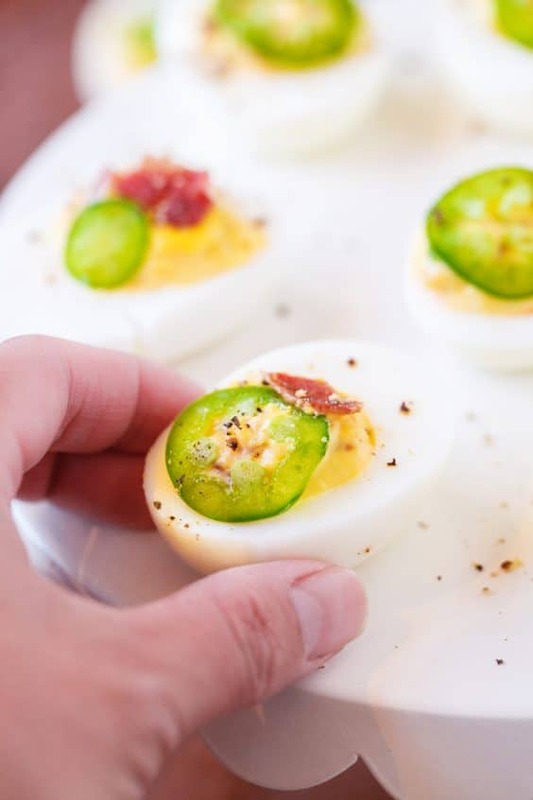 Garnish each egg with the remaining bacon, freshly cracked black pepper, and a jalapeno slice. Older eggs will peel easier than fresh eggs after being hard-boiled, I recommend using eggs that are at least a week old. I pretty much only want my deviled eggs spicy now! Great recipe!! We had these as part of a buffet for family game night this evening and man they were good!!! A bit spicy for my kids, but I made a few without the Sriracha and they demolished those! SO perfect even without the spice.